It looked like we would get a break in the weather on the first weekend in December, in fact the weatherman were calling for highs in the 70’s, but as it normally goes, they got it wrong again…… We barely made it to the 60’s! The first stop was Troy Springs State Park near the town of Branford Florida. 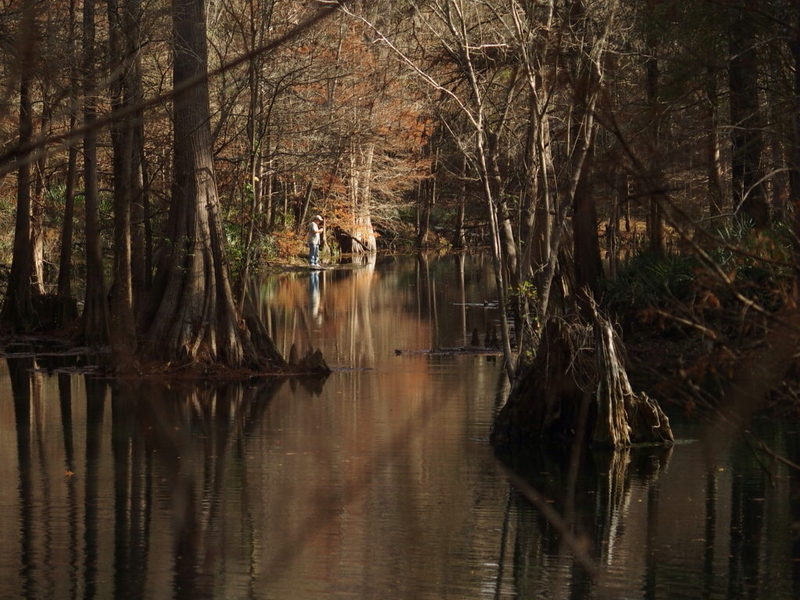 We found out quickly, this spring on the Suwannee, is a scuba divers haven. A scuba club had taken over most of the park, and even had some live music to enjoy. I found a shoreline on the river past the picnic area as I traveled along the trail. 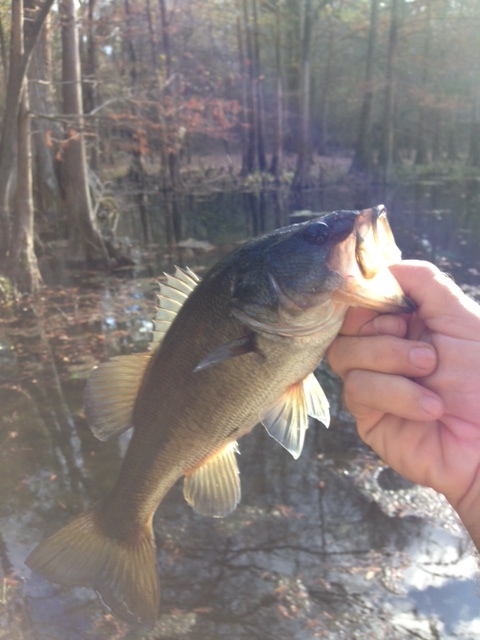 It presented a few opportunities to cast a worm and a crank bait, but did not pan out. I fished off the dock they have at the mouth of the spring, but that too was quiet. A nice park for the scuba crowd, but I would not bank on it for fishing. We went to Peacock Springs next which also did not offer much area to fish, but I was able to find a quiet spot away from the divers. Peacock Springs is unique in that it has miles and miles of underwater caves to explore for scuba divers. This is not my cup of tea, since I am a bit claustrophobic, but to each his own! I had several bites on a plastic worm and fluke, and ended up catching two small bass. Sharon and I had reservations at a cabin at Lafayette Springs near the town of Madison. It was a very nice cabin, and the park has a boat ramp on the Suwannee. I had a nice bass bite on the first cast by the ramp, but missed him. My goal was to catch the infamous Suwannee bass on this trip, but so far, I had not come across one. These bass are real fighters from what I understand, and have the look of a smallmouth. They do not get much bigger than 2 pounds, but I understand they will put up a super fight. The next park was Madison Blue Springs near the town of Madison. The ranger station here was just a trailer, and this park gets very little traffic. We only saw one other family, and had the park to ourselves most of the time. The spring run is small, as it empties into the Suwanee. There was a sandbar out in front, and I could see bass swimming from the river into the spring! I worked the edge of the river before you get to the spring, and caught a feisty bass on a Zoom Trick worm. After an hour or so, and just a few bites we were about to go when Sharon spotted a nice bass swimming down the bank. She pointed to the area, and I made a short pitch. Bam! it sucked it down and the fight was on! It jumped as Sharon was getting the camera, and came off throwing the trick worm back in my face. That’s what keeps you coming back for more! Stephen Foster State Park is a very well-kept park with a dramatic entrance way. It has a beautiful old tower, and a nice overlook over the river. 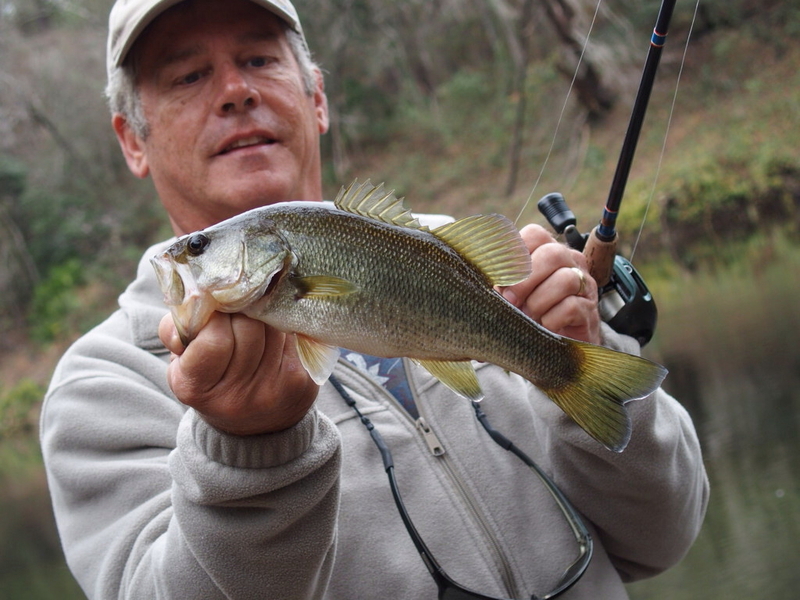 I found it fairly easy to walk the river from the canoe launch area, and had a few bites, but still no Suwannee bass. The last park we visited was the Suwannee State Park, and it had a nice boat ramp similar to Lafayette State Park. I fished the area around the ramp and walked the bank. I had a total of 5 bites on a shaky head worm and a Senko, but could not connect! It was definitely not my best trip for catching fish, but we got to see an area of Florida that we had never been to before, and it was a very enjoyable trip. This entry was posted in Uncategorized on December 19, 2014 by shurstrike.